http://www.youtube.com/watch?v=S4SH5GPElIY When Sara started a year ago she could do ZERO pull-ups. FANTASTIC work Sara!! … [Read more...] about Fantastic!! Erin let's "Jackie" know juuust what she can kiss. … [Read more...] about Hey, Jackie…! [youtube=http://www.youtube.com/watch?v=W6IGyrOs60o&feature=youtu.be]What's the secret to getting a pull-up? Actually, there are two: proper progressions and hard work. 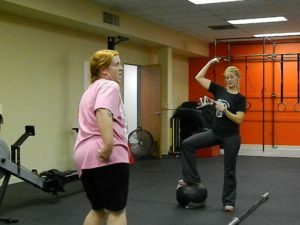 Here, Colleen is working on Assisted Pull-ups. It's a step above Ring Rows, but a step below negatives. The hard work is definitely there! Great work, Colleen! … [Read more...] about A secret to Pull-ups?